SA Heat MXO team 2011. AUTC members regularly compete at levels above the local competitions our club fields teams in. We would like to recognise the achievements of these members who have often contributed to the club as coaches and officials. 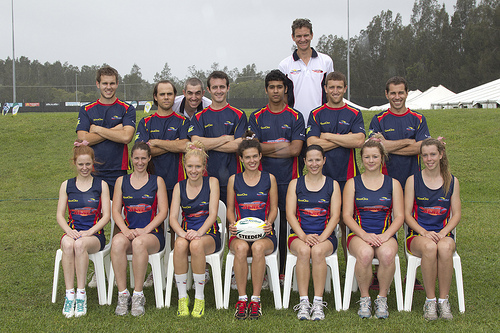 2012 - Mel Johnson (WO), Madelaine McGinty (WO), Christine Thompson (MXO), Ninh Duong (MXO), Ashley Johson (MXO), Owen Teakle (MXO), Joanne Waugh (MXO), Rebecca Timo (MXO), Mel Ralph (MXO), Darren Jones (MXO), Roxanne Betrox (MXO) Ricki Irons (MXO), Shane Marshall (Asst.Coach MXO), Anton Van Rensburg (Referee). 1999 - Darren Ball, Darren Jones, Michelle Kirby, Simon Milnes. 1998 - Penelope Bennett, Kathryn Bradshaw, Darren Jones, Elizabeth Mapletoft, Christine Lai (W. Manager). 1997 - Darren Ball, Penny Bennett, Amelia Kent, Robin Kildare, Sharon Kildare, Amanda Lamont, Jay Laurie, Bec Lewicki, Kate Lewicki, Elizabeth Mapletoft, Warwick Morgan, Athanasia Savvoudis, Chris Stewart, Natalie Taffs, Len Tanti. 1996 - Franca Costanzo, Kylie Grimshaw, Darren Jones, Robin Kildare, Sharon Kildare, Amanda Lamont, Jay Laurie, Elizabeth Mapletoft, Simon Milnes, Natalie Taffs, Len Tanti, Julian Wiedenbach. 1992 - Maria Arthur (W. Coach), Franca Costanzo, Diarmuid Crowley, Kirsty Dibden, Robin Kildare, Kristin Lienert, Josie McInerney, Athanasia Misirlis, Joanne Mitchell, Amanda Sutton, Danny Travers, Lisa Wallace. 1986 - Phil Allan, John Brown, Julie Chambers, Glen Davis, Dwina Noesbar, Andrew Short, Tony Wilkinson, Garry Williamson, Mark Wilson.